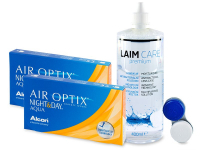 Air Optix Night and Day Aqua are monthly lenses approved for continuous wear up to 30 days. They feature an exceptionally high level of oxygen permeability to increase comfort and clarity of vision. 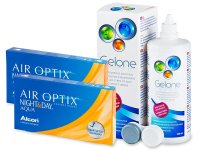 Air Optix Night and Day Aqua contact lenses by Alcon are designed to be discarded after one month of wear. According to the manufacturer, these contacts can be used for daily wear, but they are also approved for continuous wear. That means that for up to 30 days and 29 nights, you do not need to remove the lenses at all, even while you sleep. Air Optix Night and Day Aqua contact lenses are extraordinary for their high oxygen permeability, allowing a sufficient supply of oxygen to the cornea during sleep. This package contains three lenses. Read more about Air Optix Night and Day Aqua. The most convenient lenses I’ve worn, being able to put them in and completely forger about them is amazing. Great lenses, and i have no trouble with the extended wear. Was a bit nervous at first, but got the "OK" from my optician, and it's worked brilliantly. The lenses are thin, but very comfortable. You can easily forget you're wearing them. Id say that night and day aqua are the most comfortable contact lenses. I usually put them out at night but when I go somewhere at weekend I dont mind having them on alltime. Please could you tell me the cost of postage & how long they take to arrive . Hi, Sheila, For standard Royal Mail delivery, it will be about 2–3 business days for £2.90. For DHL, it will be 1–2 business days for £4.90.